There has been much talk of a drop in rail season ticket sales in the UK, whilst overall journeys are increasing. Much of the commentary has been around the change in working patterns where people are working from home more often. Many shorter distances season tickets are only worthwhile buying if you are travelling 4 or 5 times per week on the same route (or anywhere between those 2 stations). Any less and it can be cheaper to buy tickets on the day, especially if you are a shift worker and some tickets are off-peak, for example with late shifts. Some longer journeys can be worthwhile getting a season ticket if you are doing the journey only 2 days per week, as the working pattern has already been taken into account in the pricing. Many of the rail franchises have been required to roll out flexi season ticketing. Some operators have special business travel carnet tickets. Both of these can have restrictions meaning that they are only valid on one train operator, unlike the normal season tickets which are normally valid on any operator on the route. There’s some season tickets which are cheaper due to being operator specific where there is competition, partly due to the revenue not being split between operators when going through the Rail Settlement Plan. Is the recent drop in season tickets number in part due to the move to Flexi season tickets with people moving to part time commuting? 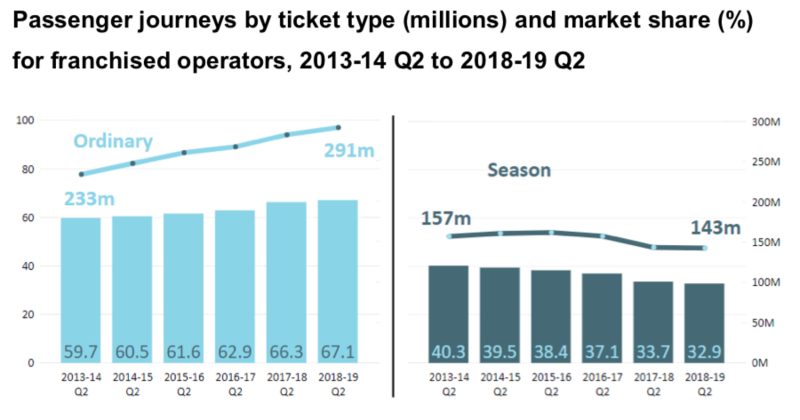 Do the Flexi season and carnet tickets need to be included in the season ticket numbers or have their own category to show the trend of the switch of ticket type? I’m also of the view that the Flexi season tickets need to be standardised such that they are available across the whole country to and from any station, and have the same standard rules of validity as ordinary daily and season tickets. We are hopefully now at a turning point where there has been enough trials about how the Flexi season tickets should work, that a wider rollout could be done. On the pricing of the Flexi season, I’m thinking they should they be a standard multiplier from the standard anytime daily ticket prices meaning that you can easily buy the tickets from any station to any station, rather than them only being available on a limited number of routes. Another option to reduce the desire or need to Flexi season tickets, would be to reduce the cost or multiplier for season tickets by making season tickets cheaper, especially considering many people are no longer travelling to work 5 days per week, and longer route specific point to point season tickets in the UK are often more expensive than the whole country Bahn Card 100 in Germany. Is it time for a UK equivalent to the German Bahn Card 100 as a means to encourage more public transport use, and reduce private motor vehicle congestion and pollution? Being a part time commuter (rest of the week working from home), Flexi-tickets are of particular interest to me, including their interoperability across operators since my commute generally involves multiple operators. This entry was posted in Train, Transport and tagged Tickets, Trains on February 1, 2019 by smsm1986.